The latest Windows 10 technical preview version — aka build 9926 — is now available for beta testers, and it showcases both compelling new capabilities and questionable design decisions that I hope get rethought before the final Windows 10 version ships this fall. If you're beta testing Windows 10 yourself, note that build 9926 won't install on PCs that use WIMboot, the technology that lets a computer boot directly from a compressed image of Windows. If you have a recent, cheap PC, it likely uses WIMboot to reduce Windows' footprint, and you won't be able to install build 9926. In build 9926, Windows 10's iconic Start menu shows disappointing UI choices. First step back: the background's monotonous color. Although there have been some leaked screenshots of transparent Start Menu builds (shown on the right), this build has only solid colors. Second, unlike in the previous technical preview, the Start menu can't be stretched either horizontally or vertically — it's one static size. But you can scroll through the tiles on the right. 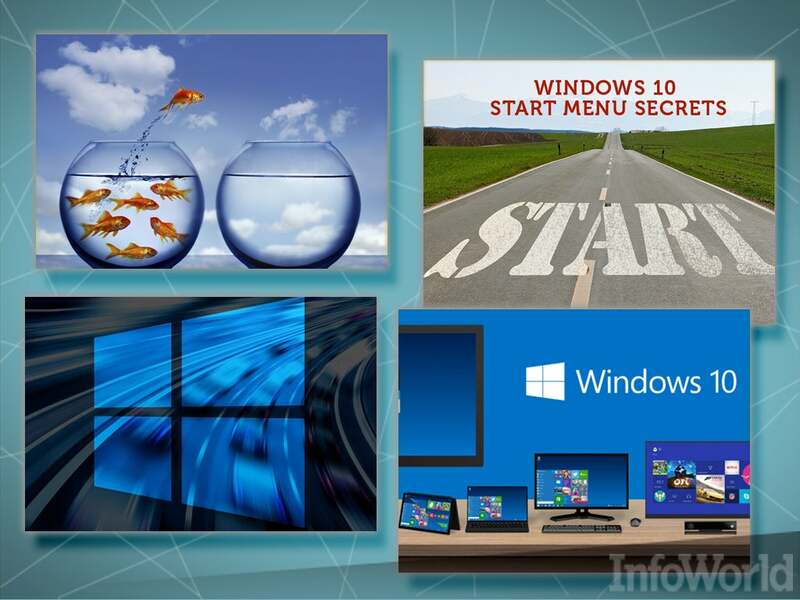 I tried to reproduce the Start menu tricks that I explored in the November technical preview (build 9860) — which I showed in a previous InfoWorld slideshow — and several of the old techniques didn't work in the current version. Most distressing, the methods for customizing folders on the Start menu — features that have been around since Vista — seem to be broken in this build. 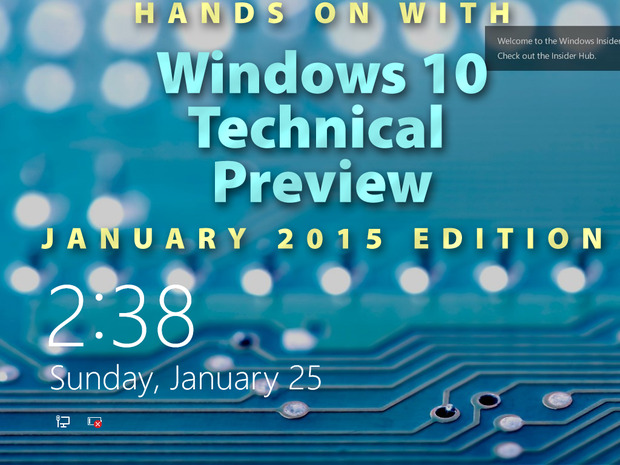 Similarly, drag-and-drop used to work on the left side of the Start menu but not so in this build. That said, the new Start menu has gone a long way in cleaning up and sorting out the monstrous All Apps menu in the previous tech preview. The On/Off switch is easier to find. 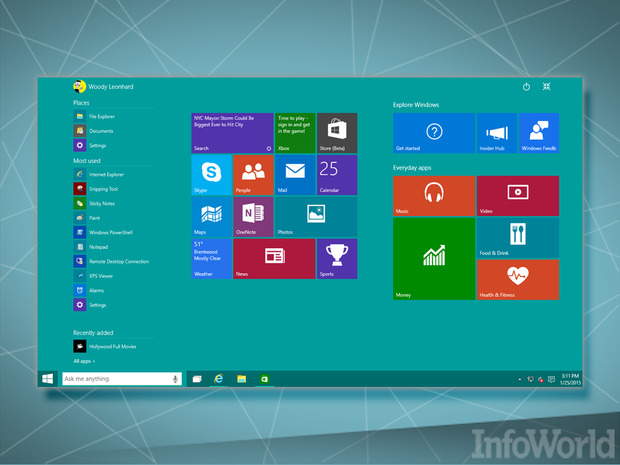 And the ability to add named groups to the tiles on the Start menu makes it much easier to navigate. When you click the four-headed arrow in the upper-right corner of the new Start menu, this touch-friendly menu appears. It's different from the Windows 8 Metro Start screen, and I think it works better. Although previous builds of the Windows 10 technical preview let you switch between the Start menu and the old Metro Start screen, the latest build has dropped the capability. As best I can tell, the screen you see here is the new universal-style Start screen. 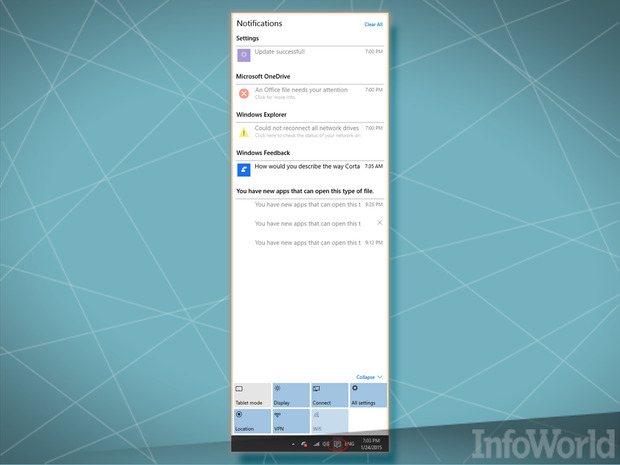 The new Notification Center appears on the right side of the screen when you click the Notifications icon, in the system tray to the left of the time and date. At some point, you will be able to click on a notification and go to whichever app may be signaling. Right now, only a few of the notification links are hot. At the bottom of the Notification Center is a stack of icons that generally take you to the Universal-style Settings app (the Advanced version of the Control Panel). In some ways, that stack of shortcuts takes the place of the now-defunct (and totally unlamented) Charms bar. The Connect icon is a little different in build 9926: It's vaguely reminiscent of the Windows 8 Internet Access charm, but it pulls in many more devices. 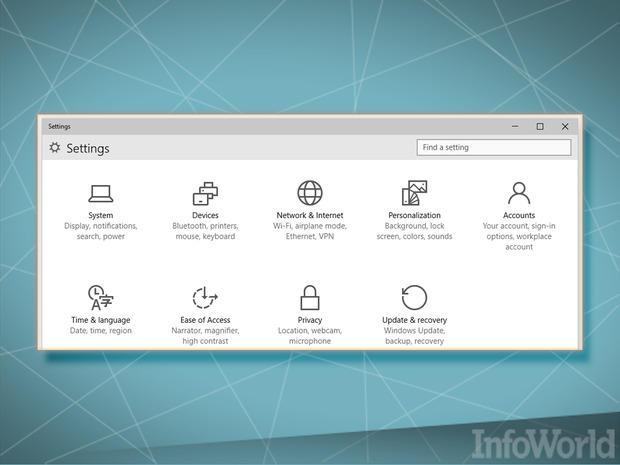 For example, you can manage multiple screens by clicking on the Connect icon. Confusingly, clicking the Display icon brings up the Display applet in the new PC Settings app, which covers many of the same bases. The new Settings app doesn't have nearly all the settings available in the Control Panel. For example, you can't turn off the irritating icon caption shadows on the desktop via the Settings app. And the Settings app has all sorts of settings – particularly for the Metro-style apps and views – that aren't covered in the Control Panel. For example, if you right-click the screen and choose Personalize, you go to the Personalization applet in Control Panel, which doesn't have many of the settings in the Settings app's Personalization section. That's a bad holdover from Windows 8's UI, and it remains confusing. File Explorer has changed significantly from the earlier technical preview, mercifully dropping the made-up location called Home. The pin icons let you pin folders to the Quick Access list, on the left of the screen. As in previous Windows 10 builds — and in Windows 8 — Windows 7 libraries are deeply hidden, and there's no way to easily work with them. 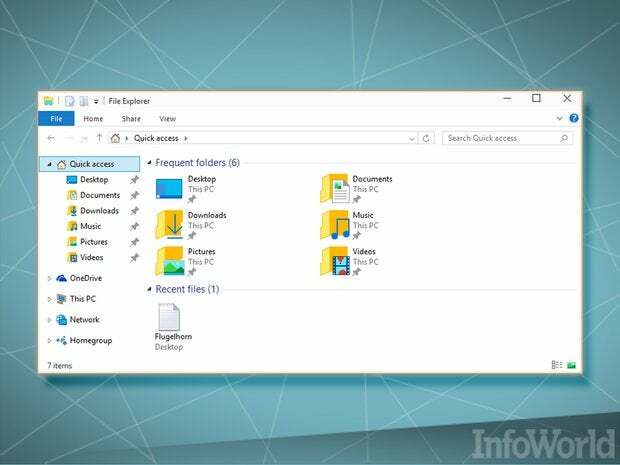 So far, you can't drag and drop a folder or file to the Quick Access list; you have to right-click the folder icon and choose Pin to Quick Access. At this point, you also can't put a file or program in the Quick Access list. The last vestiges of the Windows 8 Charms bar have been relegated to the three-line hamburger icon in the upper-left corner of Metro app windows. 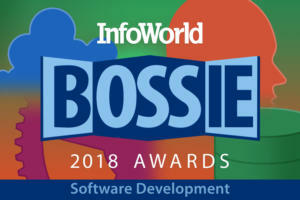 In this slide, you can see Metro Mail (which will soon be replaced by a universal app version of Outlook) with its Charms-less bar in the upper-left corner. Choosing the Search, Share, Print, and Settings in the upper left works much like using their Charms bar equivalents. Choosing the new App Commands option, at the top, brings up the touch-friendly command bar shown at the bottom of the window. Say adios, Charms. Don't let the screen door hit you on the way out. 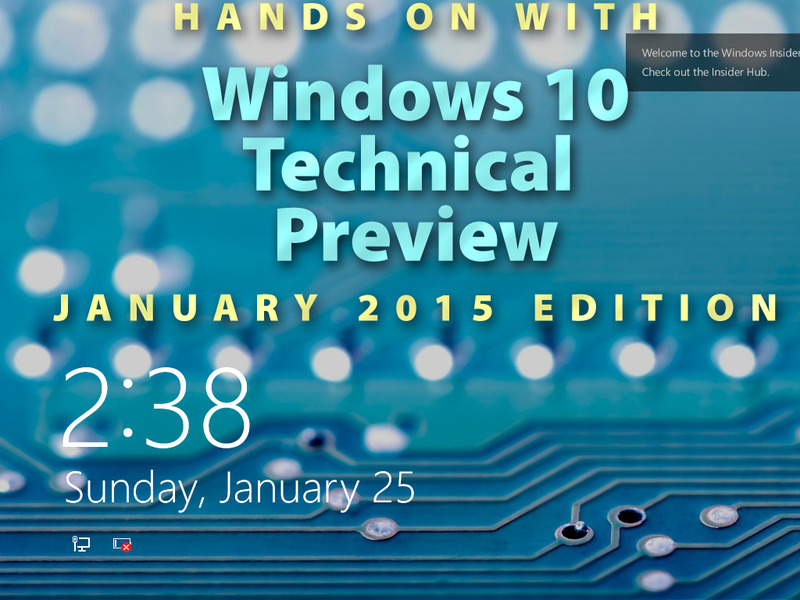 Cortana makes her Windows 10 debut in build 9926. Long rumored to be on the way, the Windows Phone-derived app now occupies the most treasured real estate on the Windows desktop: to the immediate right of the Start icon. 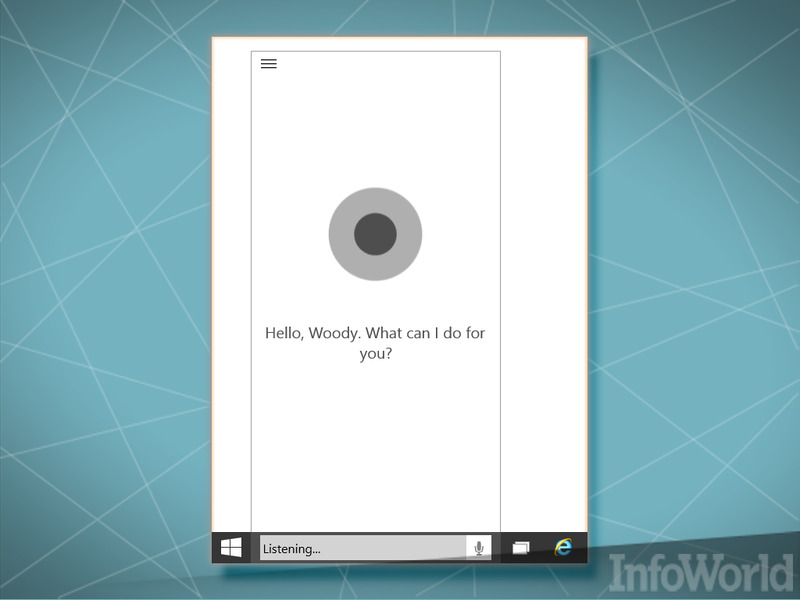 If you don't have a mike, not to worry — Cortana works with typed input, too. Click the microphone icon at the far-right edge of the Search box to get started. Take a moment to click the hamburger icon in the upper left, and tell Cortana how much — or how little — you want her to track. (You can bet Microsoft's storing everything Cortana sees, in no small part to "enhance" your shopping experience.) That's also where you enable the PC's automatic response when you say, "Hey, Cortana!" Speaking of enhanced shopping experiences, in its default configuration, Cortana — and, by extension, the new Search bar — takes your search string and bangs it against Bing. Thus, the result you see in this slide, where my search for "flugelhorn" nets one text document on my PC and a gazillion related topics from a Web search, all of which are festooned with Bing-delivered flugelhorn ads. The net result: Everything you type (or speak) into the Search bar or Cortana gets sent to Microsoft's big data bucket in the sky and is attached to your Microsoft account. 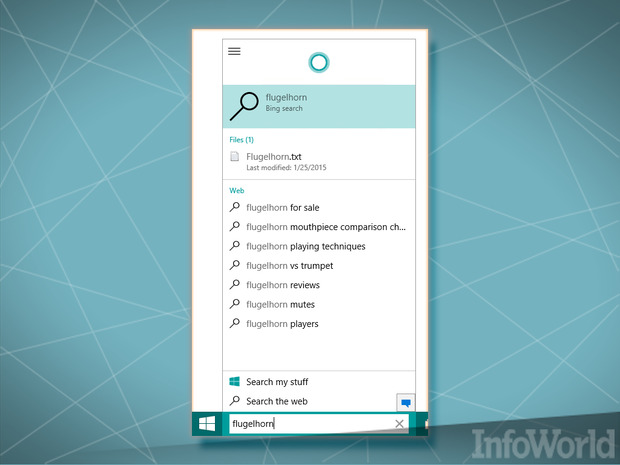 The next time you go to a website that has advertising fed by Microsoft Bing, or Yahoo, you'll likely see advertisements for flugelhorns. Yes, you can turn off the spying: Click the hamburger icon in the upper-left corner. Cortana offers a portal to seeing what Microsoft knows about you. The site's been around for a long time, but putting it front and center in Cortana should shake people up. 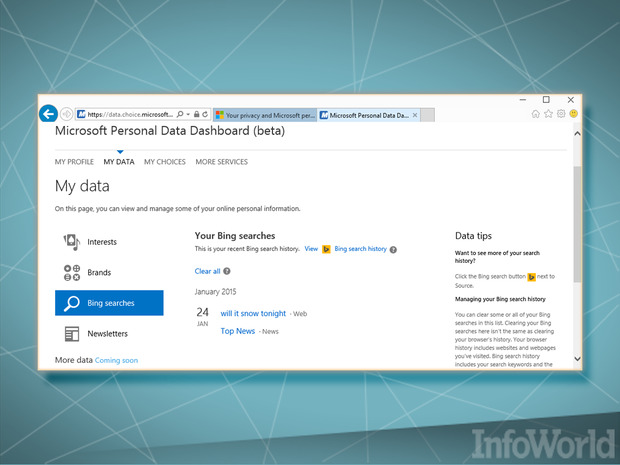 It's a sobering experience to look at Microsoft's collection of your data. Bring up Cortana (even if you don't have a mike), click the hamburger icon, click Settings, and (at the bottom) click Manage My Microsoft Advertising and Other Personalization Info. 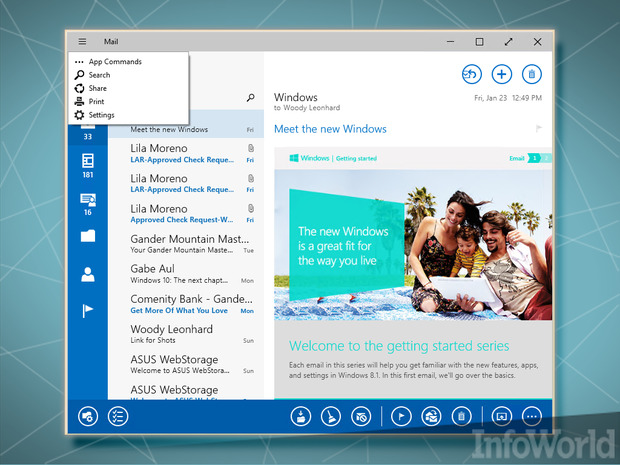 Cortana launches Internet Explorer and takes you to the Microsoft choice page. Click the link on the right — Your Data Dashboard/Dig into the Details — then at the top click My Data. Wait a minute or two, and you will see some of the dirt Microsoft has on you. I'm looking forward to the day that we can dive in and edit (which is to say, permanently remove!) anything we want. I'm tired of companies keeping my personal data and not letting me get to it. If Microsoft wants to stand head and shoulders above Google in the privacy wars, this is the place to do it. Many of the Microsoft-built Metro-style apps (now called universal apps) are still in for an overhaul — the versions of Mail, Calendar, People, and several other apps will change significantly before Windows 10 ships. Build 9926 has seven new apps, but they're not yet in the final universal style. 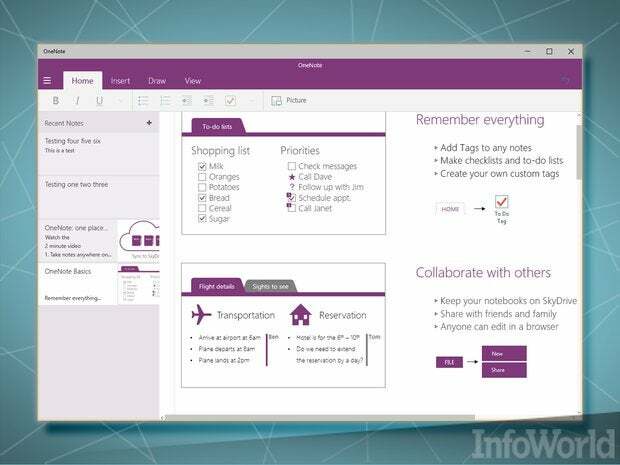 Of these, OneNote is the furthest along the path to the new universal design. The new OneNote looks like OneNote for iPad, and it works almost the same — which means it's a stunted version of the OneNote you're accustomed to using on the PC. For example, the Insert tab lets you insert only tables, files, and links, so it isn't as complete as the Windows 8 version. The hamburger icon only lets you choose Recent Notes, add or refer to specific notebooks, and print. Microsoft teases the new universal-style Photos app in Windows 10 build 9926, but it's nowhere near ready for prime time. 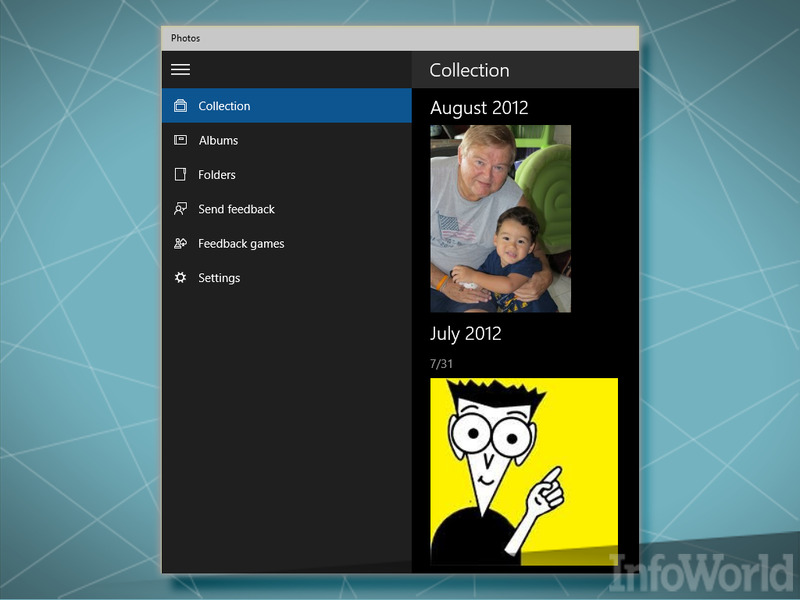 This new app shows "collections," drawn from your PC and from OneDrive and grouped by month. By default, the Photos app discards duplicates and applies rudimentary editing (such as red-eye reduction) to all photos. You can apply Windows 8-style editing to a photo. The Light and Color options in the editing mode have radial controls that allow you to vary tint and saturation, among other effects, in a touch-friendly way. Few people found those controls in Windows 8, but maybe they'll find them this time. 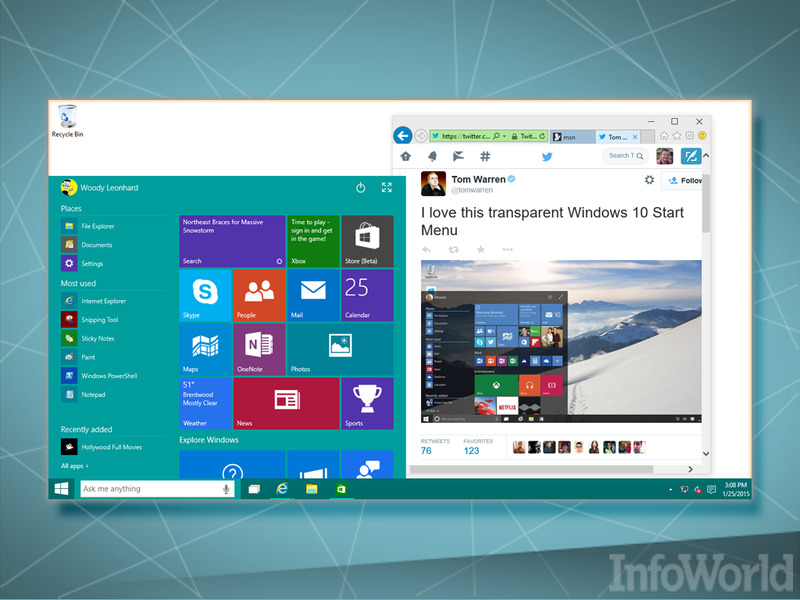 Look for big changes in this app in the shipping version of Windows 10. 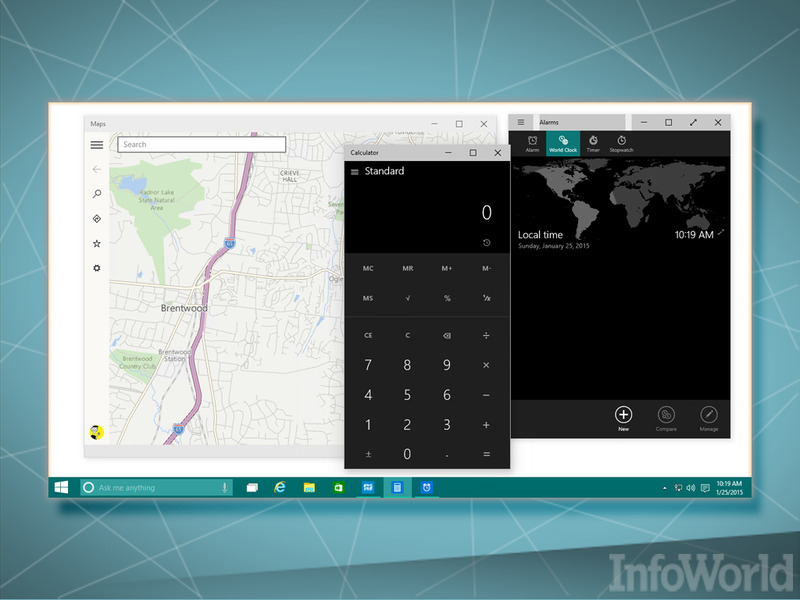 In addition to OneNote and Photos, Microsoft dishes up new versions of Alarms, Calculator, Maps, Scan, and Xbox in Windows 10 build 9926. The new Alarm app adds a world clock, but aside from a made-over interface, it's a lot like the Windows 8 Alarm app. Calculator finally brings the Windows 3-era calculator into the universal realm. There's the new Converter mode – for volume, length, weight, temperature, time, and so on — but other than the interface change, it isn't significantly better than the old Calc.exe. The new universal-style Maps app adds worthwhile features, including the ability to download and store maps for use while you're offline. There are buttons to rotate and tilt, as well as get turn-by-turn driving instructions. And the maps have been updated fairly recently — which is more than I can say for the Windows 8 Maps app. Windows 10 build 9926 includes the first implementation of Continuum, which lets Windows 10 flip back and forth between mouse-first and touch-first modes. This image, from the Jan. 21 presentation by Microsoft's corporate VP for operating systems, Joe Belfiore, shows the prompt that pops up immediately after the keyboard is detached from a two-in-one device: "Do you want to enter tablet mode?" Plug the keyboard back in and you get the prompt: "Do you want to exit tablet mode?" 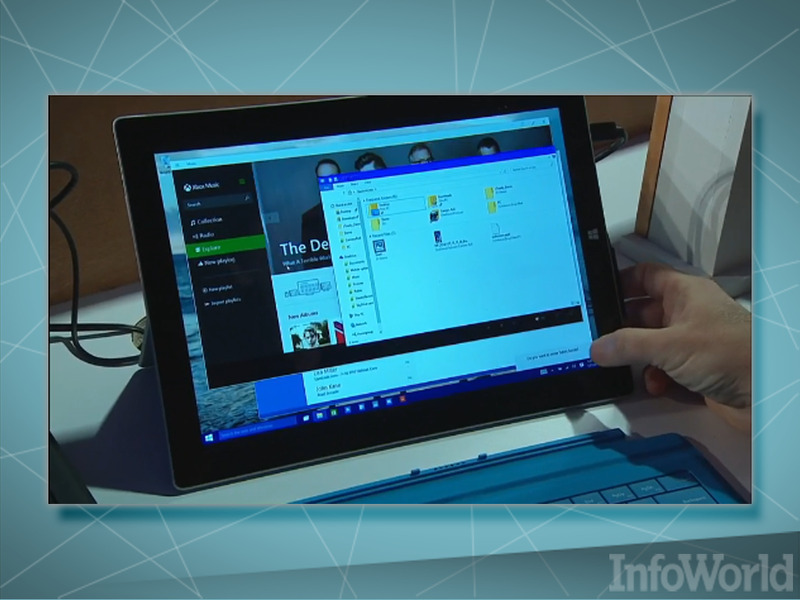 At this point, the only way you can see Continuum in action is with build 9926 running on a Surface Pro 3. Apparently, getting it to work with a two-in-one is a chore for hardware manufacturers.